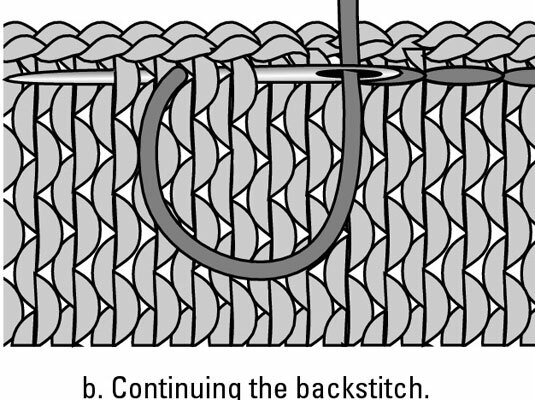 When you join knitted pieces by using backstitch, you sew them together in the conventional manner. 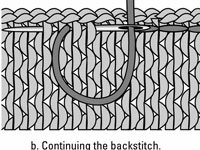 Backstitch involves placing the right sides of your pieces together and moving your tapestry needle in and out along the seam line. 1Pin the pieces right sides together. If you haven’t counted rows and one piece is slightly longer or wider than the other, you have to ease in the extra fabric so the pieces begin and end in the same place. 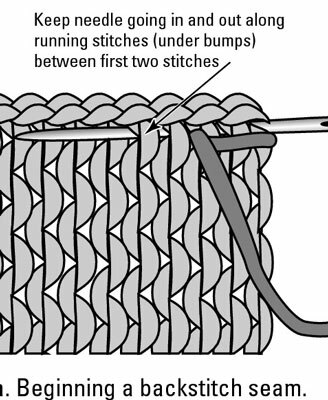 2With a tapestry needle and yarn, bring the needle from the bottom up through both layers 1 stitch in from the edge. Pass the needle between the strands of yarn, not through strands. 3Go around the edge, come out in the same spot to secure the end of the yarn, and bring the bottom edges of the pieces together. 4Go around again and come out 1 stitch farther up from the initial stitch. You can begin to see the way that the backstitch joins the knit pieces. Bring the tip out a few stitches from where it last came out. 6Continue in this manner — going forward, coming back — and keep an even tension. 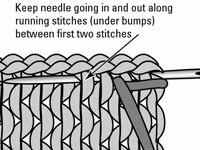 Bring your needle in and out in the spaces between stitches and avoid splitting the working yarn. Also, give your knitting a gentle stretch while you work to keep it flexible.